When Robocop hits theaters next year, it's sure to inspire heaps of think-piece op-eds about the future of law enforcement and technology. But here's the thing: that future's already here. Police forces across the country are stocking up on robots, and they're not just using them to diffuse bombs. Call them mechanical officers. These rolling robots have been an increasingly common presence on bomb squads for years now, but some police departments are getting creative with how they use them. Most of these mechanical officers come with multiple cameras and an extendable manipulator arm that's able to breach doors and even hold live weapons. Some even have a microphone and speakers that can be used as a PA system so that officers on the scene can communicate with suspects without putting an officer in harm's way. As you might imagine, this can come in real handy in standoffs and hostage situations. Last year, the Greensboro Police had one of those days. Early in the morning, they received a call about a man sitting on his porch, naked, "calling out to God." When officers arrived on the scene, the man shot at them and proceeded to barricade himself inside the house. After about five hours of attempted negotiations, it wasn't the SWAT team that persuaded the man to give himself up. It was two of the department's robots that changed his mind. The first robot, a Remotec Andros F6A, blew the door off the house, so that the second robot, a Qinetiq Dragon Runner, could enter the man's living room. The mechanical officer was not a welcome addition to the home of the suspect, who picked it up and slammed it against the floor until it was rendered inoperable. The officers then sent the Remotec into the residence, where a negotiator was able to communicate with the man. After a few hours of negotiation, he finally emerged from the house, and the SWAT team was able to take him into custody. There were no injuries from the near day-long affair. 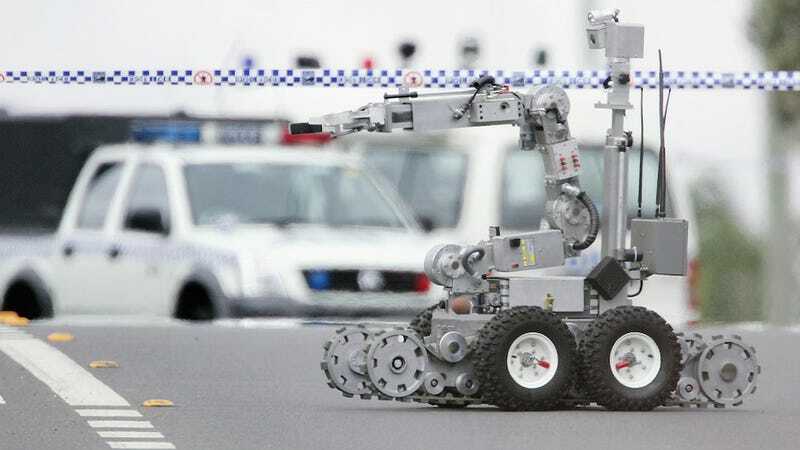 "With a robot, if an item would explode, it would cause a few thousand dollars' worth of damage to the robot that can be easily repaired," Officer Oligmueller told Gizmodo. But that's a small price to pay when it could be an officer's life on the line. "The robot being metal, it can withstand a lot more damage than I can." And they do sustain damage. Progress does not come cheap, on the other hand. Officer Oligmueller said that his department's first robot, a Remotec Andros F6A, cost them $125,000—roughly the cost of a new home in Greensboro—plus maintenance costs. On top of that, the officers who operate the robots have to go through training on a regular basis, as it's not easy to operate these machines whose control panels have upwards of 30 different buttons and switches. Despite the cost, these robots save lives. The incident in Greensboro is just one example of a mechanical officer helping to negotiate with a hostile suspect, and it certainly won't be the last. "We always consider the robot; it provides such a force multiplier for us," Greensboro's Public Information Officer Susan Danielsen told Police Magazine after the incident with the naked man last year. "I think everybody should have a robot." And maybe they should.